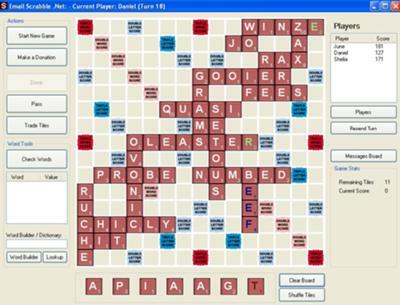 Big Scrabble game and need a big word! I have the letters APIAAGT which make a 7 letter word, but I cant find anywhere to play it. This is a big game since I am playing with co-workers and would love your help. I have attached a photo of the game and would appreciate any suggestions on where to play. Hi there Daniel - thanks for such a detailed description. I hope I'm not too late to advise on this one. Firstly, I'm afraid there are no playable bingos for you with this rack on this board. As you are aware, the letters in your rack make the seven letter word PATAGIA (the plural of PATAGIUM, which refers to the webby membrane of a bat's wing). As you also noticed, this bingo is unplayable. The only eight letter word that can be formed from this rack is PATAGIAL (pertaining to the patagium), however this requires a floating L, which you don't have on this board. 1. FEES takes an E to form FEESE (which means to unsettle). However it looks like all the E tiles, and the blanks, are gone. So this looks like a no-go. 3. The IT play off CHICLY takes an A to form ITA (a type of palm). The great thing about this is that you already have an A on your rack. In fact, you have a surplus of them! So I would look at fishing off a small number of tiles (probably two) in the hope of getting a bingo starting with A. It would take me some time to work out all the possibilities, so I'll leave it with you. But one idea off the top of my head is to extend JO at the top of the board to GAJO (a colloquial term for a non-gypsy) for 12 points. Since AG is a valid Scrabble word (it is a shortened form of 'agriculture'), this leaves two high-scoring bingo lanes open for you. One at the top of the board, if your bingo has an A in the last or second last position (e.g. PARTIAL). The other at the bottom of the board, if your bingo starts with an A (e.g. ATROPIA). Whether these outcomes are possible, and how likely each is to occur, depend on what letters are left unseen, which I haven't worked out (but you can). Anyway, this not a thorough computer analysis of your position, but it is what I would do in your situation, and it appears to give you a chance. Again, thanks for providing so much detail for this question, and I hope I've gotten back to you in time to be of help. Please let us know how the game pans out, by adding a comment below this post! P.S. There is also a floating P from the word PROBE, which you could bingo onto if you are really lucky, but it seems like a very unlikely spot to work out here. Again, I haven't analyzed this game exhaustively.